I was just moseying through some old pictures, and I came across this one. It’s one of my favorites. 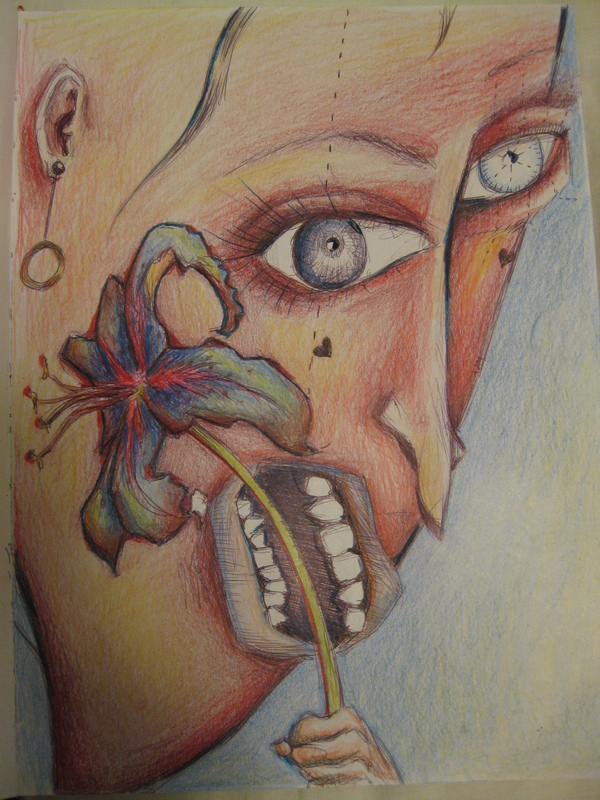 I called it “Ophelia,” after the scene in Hamlet where the supposedly crazy Ophelia goes so supposedly crazy. She’s throwing out flowers and slights left and right, knowing the veil of madness will allow her to express all she’s keep silent. But one needs to know a bit about floral/herb symbolism and history to really know where she’s getting with all that. In many ways, she’s probably getting nowhere (except where the essay-writing English 102 student chooses for her to be getting). But in one particular instance, I don’t know how else to read it except 1. she’s not crazy, and 2. she’s a baby momma and, oh boy, does that spell trouble for her. The columbine is the same way. Just this one site talks about it being symbolic of foolishness, the holy spirit, innocence…so, you know, whatever. Whatever creates you the best essay, English 102 students–that’s what these flowers and herbs mean. Except rue. Rue means Ophelia is pregnant. And that’s it. …that Ophelia could indeed be pregnant, despite how chaste everyone believes pre-women’s-lib ladies to be. Why might Ophelia give herself the plant rue–meaning feel rue, regret,–for making this choice? Well, her boyfriend has been pretty rude to her lately. Also, he just kind of took off, and it was clear things weren’t going well between them before he took off. He killed her dad, and that’s a pretty big deal, but we don’t have a lot of reason to believe that Ophelia and Polonius had the most beautiful father/daughter relationship. Nonetheless, it’s disturbing. Upsetting. Might make you rue your choice to give yourself freely to such a regrettable partner. But rue your decision to the point of suicide? But would Ophelia had known about these powers of the rue plant? Well, Ophelia was a resident of the palace, and would have been as educated as a woman of the time could expect to be. Pliny the Elder (23 AD-79 AD) and Soranus of Ephesus (1-2 century AD) had claimed it could induce abortion, and these folks certainly predate Hamlet’s setting. In my opinion, there’s not a lot of other ways to see this one. Unless you just want to argue that Ophelia was crazy and therefore killed herself from an overabundance of crazy. Or she died accidentally because…crazy. And if that’s your argument, that’s cool, English 102 student. But your teacher thinks your straightforward reading of the play boring and uninspired. She likes my picture, though, so print that out and include it with your essay. Caesar may have been Northern-Star-consistent in his determination not to welcome exiles back into Rome, but as far as being a reliable beacon of guidance for people to look up to, he has a decidedly shorter life span than any star. I read Julius Caesar in high school, but I had forgotten most of it, so I figured I’d read it again. I was pretty sure Caesar didn’t make it, but I didn’t remember much else, so I was surprised to find what I had thought would be the stabby climax of the play in Act III, not V. I was also surprised to see that this play was more like Hamlet, with a main character tormented by inner conflict, than, say, Othello, which involves a lot of individual entities in conflict with one another (not that Othello lacks inner conflict, of course). I just kind of assumed we’d see a lot more of Brutus and Caesar dealing with one another, and a lot more of Caesar in general. But, really, the play focuses on Brutus’ struggles and justifications, his relationship with Cassius, and, later, his contrast with the character of Mark Antony. I have no idea what Mark Antony’s intentions are–maybe loyalty. It’s hard to tell. Unlike Brutus, Mark Antony is shrewd. He sees that serious trouble awaits him if he does not play nice with the conspirators, but his true alliance lies with the dictatorship–he is on Caesar’s side. Then he wins the fickle, not-too-bright public to his side in a rhetorical masterpiece (3.2.72-on, beginning with lines you’ll recognize: “Friends, Romans, countrymen…”). Mark Antony manipulates; Brutus is manipulated. Mark Antony is in favor replacing the republic with a monarchy; Brutus murders Caesar for perceived tyranny and wants the people to have a voice. Yet, I very much like Mark Antony. He seems to be the hero of the play (at least, the un-tragic one). What does that mean? 1. Rebellion against autocratic rulers = bad. 2. You should kill anyone you suspect may not be loyal. You’ll regret it if you’re kind. 3. Common people are dumb and need an all-powerful leader to control them and tell them what to think. Another important thing to note about this play–there’s a whole slew of ends-justifying-means questions posed. The obvious example is of course the one Brutus deals with: is killing a friend, fellow Roman, and leader for the sake of the common good is the right thing to do? A less obvious one is this: if you have to pretend to support enemies and appear to change your principles in order for justice to be done (Mark Antony), is that okay? Or is it better to be a person who always loudly and honestly adheres to what he thinks is right, even in the face of danger (Brutus)? In essence, when Mark Antony shakes the bloody hands of those who killed Caesar, he defiles himself and his principles. I could see how he might shrink in the eyes of a reader. He can be two-faced, and he’s certainly a schemer. Yet, I just saw him as a man who knew how to further the cause of justice as he sees it. I will take on Antony and Cleopatra next to see how my hero fares. (I’ve read enough Shakespeare to predict he fares poorly.) Stay tuned. I really, really enjoyed the clarification of Benjamin’s article through Berger’s Ways of Seeing episode. The connection between all the art, photography, and film discussed in “The Work of Art in the Age of Mechanical Reproduction” and literature is much more apparent to me now. For instance, our discussion about images changing with setting makes more sense. Pictures have different meanings if you view a part of the painting at exclusion of other elements, or if you attach music or words. The balanced view that Berger took (that this can be either good or bad) made me very happy. Many times, zooming in on particular aspects of art is edifying. We do it with literature, too. We might experiment allowing literature to stand on its own as a work, we might see it as autobiographical, we might see it as a historical piece, we might see it as a psychological allegory: all of these are ways to limit the meaning of the text, but with really rich works, it’s quite useful (and fun!) But I see how this can be manipulated. The part of the video that zoomed in on the Caravaggio painting while playing the Italian opera was a great example. All of a sudden, I imagined all the peaceful figures in the painting to be screaming at one another. And the relatively pleasant Van Gogh of the cornfield seemed ominous after Berger suggested it was his last work. (Although, side note, that turns out probably not to be true. The mythbuster in me got curious and went to the Google.) This reminds me a LOT of my experience with literature and academia–a case in which I echo Berger’s unwillingness to assign the terms “good” or “bad.” Example: it was not long ago that I hated anything by Shakespeare. It all just always seemed like bombastic, overglorified drivel to me. But I had a teacher at my community college who really made Shakespeare come alive for me, and it changed the way I saw Shakespeare in general. Yet, without that context–without a teacher instructing me how to interpret the text, telling me where to look to find the worth–the works are empty to me. I suppose that’s good. It feels good; I mean, I’m an English major, I’m supposed to like Shakespeare. But it’s also is a little unsettling. Those plays are defined by the setting I experience them in. And I am just thinking what experts tell me to think. I’m like a little scholarly parrot.